Landscaping - defined as "to improve the aesthetic appearance of a piece of land by changing its contours, adding ornamental features, or planting trees and shrubs." The very core purpose of our business. Imagine structure within your landscape with planting beds that accentuate the surroundings, contrasting plant textures and colors that highlight certain areas of your yard and hardscapes that provide function while fulfilling natures appeal. At Schneider's, we thrive on the opportunity to show you how this can become a reality. Understanding that you to are expect a return on your investment, we start the landscaping process with a meeting between you and one of our landscape designers. Their number one objective is to find out about you! How you manage your existing landscaping. How you make use of your yard. If you entertain and how often. We ask these questions to find out as much about you as we can so our landscape designers can custom tailor a landscape design around you, your enjoyments and your habits. All Images and Content Copyright Schneider's Lawncare and Landscaping | Landscaping, Dayton & Cincinnati. All rights reserved. Whether you are adding a simple landscape to gain curb appeal or adding a rear yard paradise, our landscape team is prepared to install it. Their experience and landscape knowledge of installing pergolas, garden walls, outdoor rooms and kitchens ensures that your project will be installed correctly and according to the landscape design. The size and dollar value of your project is not important to us, but that we exceed your expectations, trusting that you will be happy to tell your neighbor about Schneider's Lawn Care and Landscaping. ​Note: Schneider's Lawn Care and Landscaping does not provide free custom landscape or patio designs. We would be more than happy of discuss your project and offer suggestions at no charge. However, there is a design fee if you would like to have your project sketched or drawn for presentation. 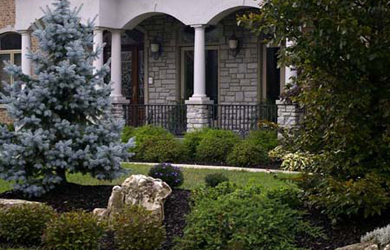 Learn more about our Landscape Design Services.